Background: There are limited data about the effect of maternal influenza infection on fetuses and newborns. We performed a secondary analysis of data from the Mother’s Gift project, a randomized study designed to test the effectiveness of inactivated influenza and pneumococcal vaccines during pregnancy. 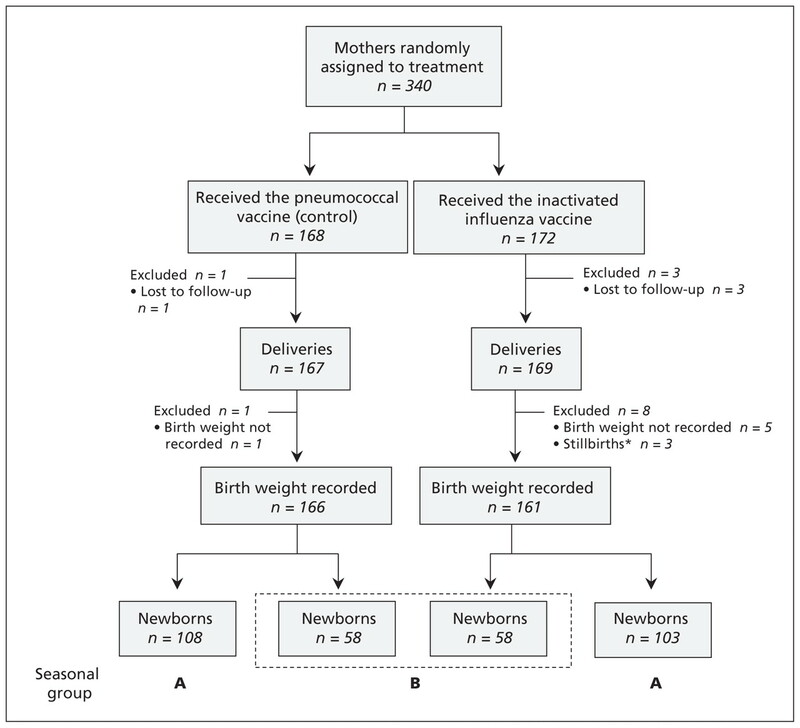 Methods: In the Mother’s Gift project, 340 pregnant women in Bangladesh received either inactivated influenza vaccine or 23-valent pneumococcal polysaccharide vaccine (control). This study was performed from August 2004 through December 2005. We performed a secondary analysis of outcomes following maternal influenza immunization during two periods: when influenza virus was not circulating (September 2004 through January 2005) and when influenza virus was circulating (February through October 2005). We assessed gestational age, mean birth weight and the proportion of infants who were small for gestational age. Results: During the period with no circulating influenza virus, there were no differences in the incidence of respiratory illness with fever per 100 person-months among mothers and infants in the two groups (influenza vaccine: 3.9; control: 4.0; p > 0.9). The proportion of infants who were small for gestational age and the mean birth weight were similar between groups (small for gestational age: influenza vaccine 29.1%, control 34.3%; mean birth weight: influenza vaccine 3083 g, control 3053 g). During the period with circulating influenza virus, there was a substantial reduction in the incidence per 100 person-months of respiratory illness with fever among the mothers and infants who had received the influenza vaccine (influenza vaccine: 3.7; control: 7.2; p = 0.0003). During this period, the proportion of infants who were small for gestational age was lower in the influenza vaccine group than in the control group (25.9% v. 44.8%; p = 0.03). The mean birth weight was higher among infants whose mothers received the influenza vaccine than among those who received the control vaccine during this period (3178 g v. 2978 g; p = 0.02). Interpretation: During the period with circulating influenza virus, maternal immunization during pregnancy was associated with a lower proportion of infants who were small for gestational age and an increase in mean birth weight. These data need confirmation but suggest that prevention of influenza infection in pregnancy can influence intrauterine growth. The Mother’s Gift project is a randomized trial designed to assess the safety and efficacy of maternal pneumococcal and influenza immunization in Bangladesh. The primary outcomes of this study have been reported.2 In the current article, we report the results of a secondary analysis to assess the hypothesis that influenza immunization influenza the outcomes of infants whose mothers were exposed to influenza during pregnancy. Flow of mothers and infants through the study. *Stillbirths occurred in December 2004, January and February 2005. There was no difference in the number of stillbirths between groups (Fisher exact test p = 0.3). Periods of influenza virus circulation: A) limited circulation, September 2004 through January 2005; B) confirmed circulation, February through October 2005. The randomization sequence was generated by computer and was stratified by clinic and blocked in groups of four. Sequentially numbered opaque envelopes containing the study group assignments were provided to the recruitment clinics. Clinic nurses, who were not involved in the collection of project data, performed the immunizations. Mothers, families and study staff who collected illness and other data were unaware of the study group assignments. The protocol was approved by the institutional review boards of the International Centre for Diarrheal Disease Research, Bangladesh, and the Bloomberg School of Public Health at Johns Hopkins University. The use of commercial vaccines licensed by the US Food and Drug Administration was approved by the Directorate of Drug Administration of the Government of the People’s Republic of Bangladesh. Mothers and fathers provided signed informed consent. To compare outcomes between study groups, we calculated odds ratios (ORs) and we assessed differences in group means using the Student t test and the Mann–Whitney U test. We assessed proportions using the χ2 and Fisher exact tests. All tests were two-sided. We also calculated ORs for outcomes adjusted for selected characteristics (gestational age at vaccination, interval between immunization and birth) using multiple logistic and linear regression. In our initial report,2 we used a rapid test to document the circulation of the influenza virus in Dhaka, Bangladesh, from January through October 2005. An independent local influenza surveillance study in Dhaka isolated influenza viruses in children with febrile respiratory illnesses from early 2004 through December 2007,7 and they reported very few influenza viruses among ill children between September 2004 and January 2005. Some influenza virus isolates were reported during February and March, and a substantial number of influenza A/H3N2 and B viruses were isolated from April through June 2005.7 We defined two periods: one with limited circulating virus (September 2004 through January 2005) and one when the influenza virus was shown to be circulating (February through October 2005) (Figure 2). The randomization of mothers was successful overall in producing demographically similar maternal study groups;2 nevertheless, we tested for maldistribution in each study period of several factors likely to influence the effect of the vaccine on the fetus, including gestational age at immunization and delivery, the interval between maternal immunization and birth, and infant Apgar scores (Table 1). We also tested for distribution of maternal age, parity, height and weight three to four months after delivery. Incidence of respiratory illness with fever greater than 38°C among mothers and infants combined, and influenza virus before and after January 2005. Our seasonal analysis focused on the 116 infants born during the February–June 2005 period who were in utero for 22–94 days after maternal immunization while the influenza virus circulated. We created a binary variable for study periods before and after Jan. 31, 2005, to distinguish the period with limited virus circulation from the period with proven virus circulation. We performed a formal test of interaction, followed by an analysis stratified by the influenza circulation period. Subgroup analysis of clinical trial data are often discouraged to avoid misleading results, particularly in the absence of an independent underlying biological model.8 However, in studies of influenza virus infection and immunization, there is strong evidence for seasonality of the circulation of influenza virus and seasonality of antigenic matching of influenza vaccine with the circulating virus subtypes,9–13 providing substantial biologic support for this post-hoc analysis. During the study, 340 pregnant women were assigned to receive inactive influenza vaccine or pneumococcal vaccine (control) (Figure 1). In total, 336 infants were delivered, and 327 were included in our analysis. Three stillbirths occurred during the study period (December 2004, January and February 2005) among the mothers who received the influenza vaccine. During the entire study period, 28% of infants in the influenza vaccine group were small for gestational age, and 38% were small for gestational age in the control group (OR 0.63, 95% CI 0.4–1.0; p = 0.05). The overall mean birth weight was 3% higher in the influenza vaccine group than in the control group (influenza vaccine 3117 g v. control 3027 g; p = 0.09) (Table 2). During the period with limited virus circulation, there was no clinical effectiveness of the influenza vaccine on maternal plus infant respiratory illness (incidence rate ratio 0.99; p > 0.9) (Appendix 1 and 2, available at www.cmaj.ca/lookup/suppl/doi:10.1503/cmaj.110754/-/DC1). During the period with circulating influenza virus, the incidence rate ratio was 0.51 for all respiratory illness (p = 0.0003) (Table 3). There was significant interaction for respiratory illness between vaccine groups and the period (limited or confirmed circulating influenza virus) (p = 0.02). During the period with limited virus circulation, the proportion of infants who were small for gestational age was similar in both groups (influenza vaccine 29.1%; control 34.3%, OR 0.79 [95% CI 0.44–1.41]; p = 0.4) (Table 4). In contrast, during the period with circulating virus and increased clinical effect of the influenza vaccine (Figure 2), the proportion of infants who were small for gestational age was 25.9% in the influenza vaccine group and 44.8% in the control group (OR 0.43, 95% CI 0.20–0.94; p = 0.03) (Table 4). When we analyzed this data using the WHO growth standard, the OR was 0.39 (95% CI 0.16–0.92; p = 0.02) (Appendix 3, available at www.cmaj.ca/lookup/suppl/doi:10.1503/cmaj.110754/-/DC1). During the period with limited circulating virus, the mean birth weight was 3053 g in the influenza vaccine group and 3083 g in the control group (p = 0.9). In contrast, during the period with circulating influenza virus, the mean birth weight was 3178 g in the influenza vaccine group and 7% higher than 2978 g in the control group (p = 0.02) (Table 4, Figure 3). Distribution of birth weight by group and period. Periods of influenza virus circulation: A) limited circulation, October 2004 through January 2005; B) confirmed circulation, February through October 2005. 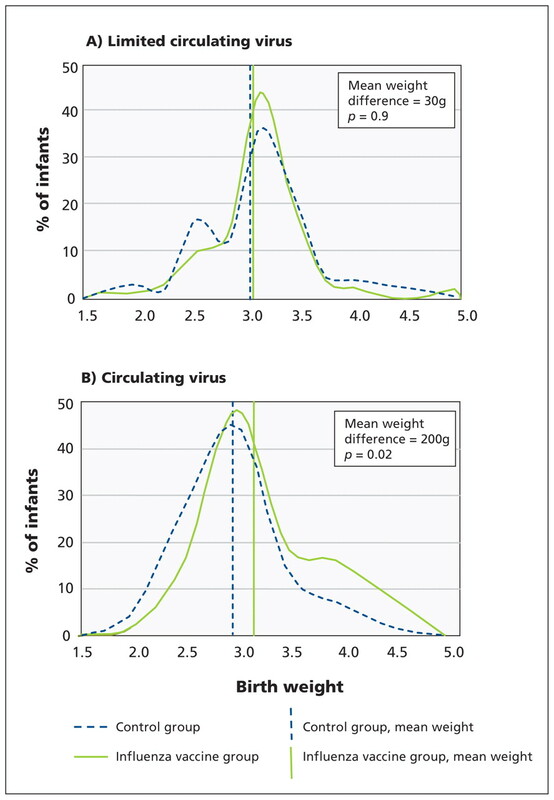 Figure 3 shows that, during the period with limited circulating influenza virus, the distribution of birth weight was similar in the two groups (Mann–Whitney U test, p = 0.9). In contrast, during the period with circulating virus, there was a shift in the distribution of birth weight to higher values among infants born to mothers vaccinated against influenza (Mann–Whitney U test, p = 0.02). We did not detect a difference in the rate of premature births between the influenza vaccine and control groups when there was circulating influenza virus (3.5% v. 6.9%; OR 0.48 [95% CI 0.08–2.74]; p = 0.4) (Table 4). Although the number of infants with a low birth weight was small during the period with circulating influenza virus, there were fewer infants who weighed less than 2500 g in the influenza vaccine group (1.7%) than in the control group (8.6%); however, this difference was not significant (OR 0.19 [95% CI 0.02–1.64]; p = 0.09). During the period with circulating influenza virus, the mean gestational age of the fetus when the mother was vaccinated was greater and the mean interval from immunization to birth was six days shorter in the influenza vaccine group than in the control group (Table 1), suggesting that, for the mothers who received influenza vaccine, there were fewer days available for the generation of a maternal immune response and for transplacental antibody transfer to the fetus, possibly limiting the observed effect of influenza vaccine for some study outcomes. We performed multiple logistic regression to estimate adjusted ORs for small for gestational age after accounting for the effect of gestational age at immunization and the interval between immunization to birth. The adjusted ORs are similar to the unadjusted ones (Table 4). During the period with circulating influenza virus, the ORs were somewhat lower. Similarly, we performed multiple linear regression to estimate birth weight adjusted for gestational age at immunization and the interval between immunization and delivery. The adjusted birth weights were similar in magnitude to the unadjusted birth weights (Table 4). There were no significant differences between the influenza vaccine group and the control group in the distribution of infant gestational age at birth, Apgar score or the maternal characteristics of age, parity, height and postpartum weight (Table 1 and 2). We found that immunization against influenza during pregnancy had a substantial effect on mean birth weight and the proportion of infants who were small for gestational age but only during the period of increased circulating influenza virus in the community. There have been only four reports of infection of the fetus or placenta with nonpandemic influenza viruses, suggesting that this may be an infrequent event.20–23 The fetus gains 35–40 g/d (~1% of birth weight) in the last month of gestation.24 Several days of maternal illness, including fever, anorexia25 and circulating proinflammatory cytokines,26 even without severe maternal respiratory illness or admission to hospital, may account for the fetal effects we observed. The maternal generalized inflammatory responses to infection with the influenza virus likely modulates maternal metabolism, placental function and the transfer of nutrients to the fetus. The circulating maternal proinflammatory chemokines, cytokines and other factors27–29 may cross the placenta and have indirect inflammatory and metabolic effects in the fetus. The mechanisms of the effect of maternal influenza on fetal growth have not been described, and studies of the pathogenesis of this antenatal infection should be undertaken to elucidate approaches to treatment and prevention. Several retrospective hospital record reviews and case–control studies have reported that infants born to mothers infected or exposed to influenza have mean birth weights similar to a variety of controls, but these observational assessments were not randomized trials30–33 and may not have captured the effects of influenza vaccine because of bias in the selection of cases or controls. A recent retrospective observation of the effect of influenza vaccine in Georgia, United States, showed that the likelihood of small-for-gestational-age infants born to women who had been vaccinated against influenza was reduced by 69% during a period of widespread influenza activity.41 Several studies in North America and the United Kingdom of influenza-like ilnesses42 or proven influenza illness43,44 have reported significant reductions in mean birth weight, ranging from 90 to 285 g.
The strengths of our study include the randomized double-blind design, the intention-to-treat analysis, the close observation of the participants and the monitoring of influenza infections in infants. The use of two growth standards with similar results provides some confidence about our observations. Because there is no Bangladesh reference for weight for gestational age, we used a North American standard.5 Many consider this reference population of a variety of ethnic groups, with relatively low levels of nutritional deprivation, to be a good reference for assessment of fetal growth potential. Because the study outcomes were specified a priori, we did not correct for multiple comparisons in this analysis. Therefore, this secondary analysis may have some results that represent type I errors. In addition, the relatively small number of observations in 116 infants potentially exposed to maternal influenza infection during gestation may mean that some of our estimates are not precise. The pneumococcal vaccine that was used as a control may have had an independent positive effect on the outcomes among infants. If that were the case, the observed difference between the two vaccine groups would be an underestimate of the true effect of influenza vaccine compared with placebo. Our data suggest that influenza infection during pregnancy may affect fetal development. The overall absolute reduction in the proportion of infants who were small for gestational age was 0.1, suggesting that every 10 maternal influenza immunizations prevented the birth of one small-for-gestational-age infant. During the period with local circulation of influenza virus, the number needed to vaccinate to prevent one small-for-gestational-age birth is six mothers. There is substantial data to show that full-term infants who are small for gestational age have an increased risk of lifelong consequences.45–47 Effective, safe vaccines to prevent influenza during pregnancy are available and recommended by a variety of agencies.48–51 Antenatal programs to vaccinate against tetanus in limited-resource regions have achieved a substantial level of coverage, reaching, for example, 80% of all pregnant women in Bangladesh.52 If our data about the effect of antenatal influenza immunization on fetal development are confirmed, the existence of effective antenatal immunization delivery systems suggests influenza vaccine may be a feasible addition to routine antenatal immunization programs. The authors thank the field and data management team at the International Centre for Diarrheal Disease Research, Bangladesh, for their efforts. The authors thank Dr. David Sack for his invaluable assistance in the project. Competing interests: Mark Steinhoff has served as a consultant for Merck. No competing interests declared by any other authors. This article was peer reviewed. Contributors: Mark Steinhoff had full access to all of the data in the study and takes responsibility for the integrity of the data and the accuracy of the data analysis. Mark Steinhoff, Saad Omer, K. Zaman, Eliza Roy, Shams Arifeen and Robert Breiman designed the study. Eliza Roy, K. Zaman, Shams Arifeen and Rubhana Raqib acquired the data. Mark Steinhoff, K. Zaman, Eliza Roy, Caitlan Dodd, Saad Omer and Shams Arifeen performed the analysis and interpretation of data. Mark Steinhoff, Saad Omer and Caitlan Dodd performed the statistical analysis. Mark Steinhoff, Saad Omer, K. Zaman and Robert Breiman drafted the manuscript, which was critically revised by Mark Steinhoff, Saad Omer, K. Zaman, Eliza Roy, Robert Breiman and Rubhana Raqib. Shams Arifeen, K. Zaman and Mark Steinhoff provided administrative, technical or material support. K. Zaman and Mark Steinhoff supervised the study. All of the authors approved the final version of the manuscript submitted for publication. Funding: The Mother’s Gift project was supported by the Bill and Melinda Gates Foundation; the United States Agency for International Development; Wyeth Pharmaceuticals Inc.; the Thrasher Research Fund; Aventis Pasteur; the International Centre for Diarrheal Disease Research, Bangladesh; and the Bloomberg School of Public Health at Johns Hopkins University. Dr. Omer was awarded the Maurice R. Hilleman Early-Stage Career Investigator Award by the National Foundation for Infectious Diseases (NFID). The award was funded by an unrestricted educational grant to the NFID from Merck Co. Inc.; however, Dr. Omer had no direct interaction with Merck Co. Inc.
. The underrecognized burden of influenza in young children. N Engl J Med 2006;355:31–40.
. Effectiveness of maternal influenza immunization in mothers and infants. N Engl J Med 2008;359:1555–64.
. Influenza vaccination in pregnancy: current evidence and selected national policies. Lancet Infect Dis 2008;8:44–52.
. Maternal infection and adverse fetal and neonatal outcomes. Clin Perinatol 2005; 32:523–59.
. A nearly continuous measure of birth weight for gestational age using a United States national reference. BMC Pediatr 2003;3:6.
WHO Multicentre Growth Reference Study Group. WHO child growth standards: methods and development. Geneva (Switzerland): World Health Organization; 2006. Available: www.who.int/childgrowth/standards/technical_report/en/ (accessed 2011 Nov. 15).
. Influenza is a major contributor to childhood pneumonia in a tropical developing country. Pediatr Infect Dis J 2010;29:216–21.
. Statistics in medicine —reporting of subgroup analyses in clinical trials. N Engl J Med 2007;357:2189–94.
. 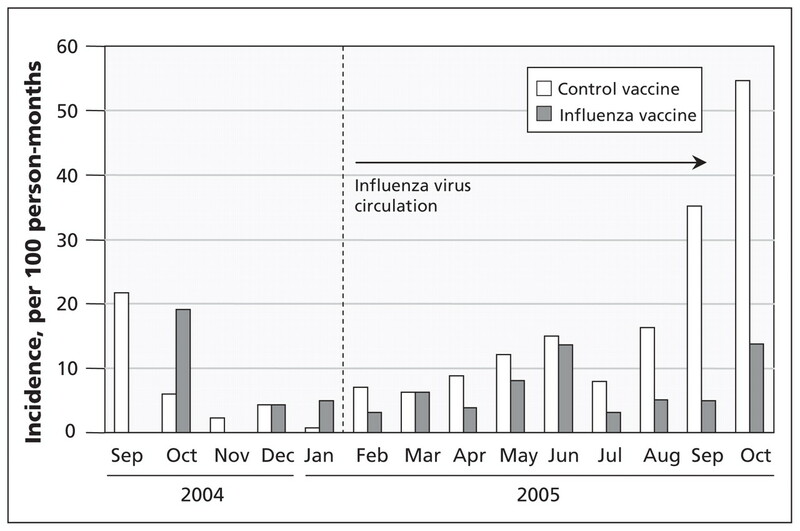 Effectiveness of inactivated influenza vaccines varied substantially with antigenic match from the 2004–2005 season to the 2006–2007 season. J Infect Dis 2009;199:159–67.
. The efficacy of live attenuated, cold-adapted, trivalent, intranasal influenzavirus vaccine in children. N Engl J Med 1998;338:1405–12.
. Influenza vaccine: the challenge of antigenic drift. Vaccine 2007;25:6852–62.
. Influenza vaccine effectiveness among 50–64-year-old persons during a season of poor antigenic match between vaccine and circulating influenza virus strains: Colorado, United States, 2003–2004. Vaccine 2007; 25:154–60.
. Using surveillance to evaluate influenza vaccine effectiveness. J Infect Dis 2009;199:155–8.
. Severity of 2009 pandemic influenza A (H1N1) virus infection in pregnant women. Obstet Gynecol 2010;115:717–26.
. Influenza occurring in pregnant women. JAMA 1919; 72:978–80.
. H1N1 2009 influenza virus infection during pregnancy in the USA. Lancet 2009;374:451–8.
. Pandemic 2009 influenza A(H1N1) virus illness among pregnant women in the United States. JAMA 2010;303:1517–25.
. Epidemic pneumonia (Spanish Influenza) in pregnancy: effect in one hundred and one cases. JAMA 1918;71:1998–9.
. Seasonal variation of birthweight in Bangladesh. Ann Trop Paediatr 1987;7:66–71.
. Transplacental transfer of influenza virus. JAMA 1971;216:1022–3.
. Seasonal influenza A (H1N1) infection in early pregnancy and second trimester fetal demise. Emerg Infect Dis 2011;17:107–9.
. Transplacental passage of influenza A/Bangkok (H3N2) mimicking amniotic fluid infection syndrome. Am J Obstet Gynecol 1984;149:856–9.
. [Involvement of the afterbirth in influenza] [article in Russian]. Arkh Patol 1987;49:19–25.
. Normal fetal growth and the significance of fetal growth retardation. In: Davis JA, Dobbins J, editors. Scientific foundations of paediatrics. Philadelphia (PA): Saunders; 1974. p. 69–80.
. Anorexia of infection: current prospects. Nutrition 2000;16:996–1005.
. Understanding the symptoms of the common cold and influenza. Lancet Infect Dis 2005;5:718–25.
. Role of apoptosis and cytokines in influenza virus morbidity. FEMS Microbiol Rev 2005;29:837–50.
. Symptom pathogenesis during acute influenza: interleukin-6 and other cytokine responses. J Med Virol 2001;64:262–8.
. Differential expression of chemokines and their receptors in adult and neonatal macrophages infected with human or avian influenza viruses. J Infect Dis 2006;194:61–70.
. Pregnancy complications and delivery outcomes of pregnant women with influenza. J Matern Fetal Neonatal Med 2006;19:135–40.
. A prospective study of influenza infections during pregnancy. J Epidemiol Community Health 1980;34:124–8.
. Maternal morbidity and perinatal outcomes among pregnant women with respiratory hospitalizations during influenza season. Am J Obstet Gynecol 2003;189:1705–12.
. Influenza virus infection in the second and third trimesters of pregnancy: a clinical and seroepidemiological study. BJOG 2000;107:1282–9.
. Antimicrobial prophylaxis in pregnancy: a randomized, placebo-controlled trial with cefetamet-pivoxil in pregnant women with a poor obstetric history. Am J Obstet Gynecol 1997;177:680–4.
. The use of anti-malarial drugs to prevent malaria in the population of malaria-endemic areas. Am J Trop Med Hyg 2004;70:1–7.
. Maternal nutrition and birth outcomes. Epidemiol Rev 2010;32:5–25.
. The effect of maternal micronutrient supplementation on early neonatal morbidity in rural Nepal: a randomised, controlled, community trial. Arch Dis Child 2008;93:660–4.
. Effects of alternative maternal micronutrient supplements on low birth weight in rural Nepal: double blind randomised community trial. BMJ 2003; 326:571.
. Effect of food supplementation during pregnancy on birthweight. Pediatrics 1975;56:508–20.
. Pneumonia as a complication of pregnancy. J Matern Fetal Med 1999;8:151–4.
. Maternal influenza immunization and reduced likelihood of prematurity and small for gestational age births: a retrospective cohort study. PLoS Med 2011;8:e1000441.
. Effect of respiratory hospitalization during pregnancy on infant outcomes. Am J Obstet Gynecol 2011;204:54S–57S.
. Perinatal outcomes after maternal 2009/H1N1 infection: national cohort study. BMJ 2011;342:d3214.
. Neonatal characteristics and outcomes of pregnancies complicated by influenza infection during the 2009 pandemic. Am J Obstet Gynecol 2011; 204(Suppl 1):58–63.
. Effects of being born small for gestational age on long-term intellectual performance. Best Pract Res Clin Endocrinol Metab 2008;22:477–88.
. Cognitive development of term small for gestational age children at five years of age. Arch Dis Child 2000;83:25–30.
. Effect of in utero and early-life conditions on adult health and disease. N Engl J Med 2008;359:61–73. Influenza vaccines. Wkly Epidemiol Rec 2005;80:279–87. National Advisory Committee on Immunization (NACI). Statement on influenza vaccination for the 2008–2009 season. An Advisory Committee Statement (ACS). Can Commun Dis Rep 2008;34:1–46.
. Prevention and control of influenza: recommendations of the Advisory Committee on Immunization Practices (ACIP), 2008. MMWR Recomm Rep 2008;57(RR-7):1–60. H1N1 (2009) winter flu: Updated advice for providers of maternity services. London (UK): Department of Health, Health Protection Agency; 2011.
. Influenza vaccine for pregnant women in resource-constrained countries: a review of the evidence to inform policy decisions. Vaccine 2011;29:4439–52.